It’s so complicated. Thousands of years of history. Old hatreds. Both sides entrenched. No solution seems possible. These are common sentiments when it comes to the conflict between Israelis and Palestinians—a conflict that seems to stretch back millennia, with no end in sight. A stalemate punctuated by rocket attacks, massacres, and uprisings. But the birth of the modern state of Israel was far from inevitable. As AND THERE WAS ISRAEL compellingly shows, when it comes to Israel and Palestine, the current crisis is rooted choices made in response to 19th century geopolitics, colonial imperatives, and the Holocaust. The 19th century was the era of the rise of the nation-state—a period rife with the invention of history. If every nation were to have its own state, what of the Jews? Early discussions of a Jewish state were not limited to placing it in Palestine. Argentina and the United States were both floated as possible locales. Not all Jews were Zionists, and not all early Zionists were Jews, with Christian Zionists split between those who welcomed a Jewish state as a precursor to the End Times and those who saw it as a way to decrease the Jewish population elsewhere. Even the partition of Palestine was far from inevitable, as many instead supported a single, federal state. And in central and eastern Europe, working-class, Yiddish-speaking Jews were far less likely to support Zionism than those who were better off. AND THERE WAS ISRAEL covers the history of Zionism from the writings of Theodore Herzl to the expulsion of Palestinians from hundreds of villages following the declaration of the State of Israel in 1948. Political sociologist Riccardo Bocco argues the seeds of later conflict were in part sown by the contradictory commitments made by the British during the period of the Mandate: promising to recognize an independent Arab state in exchange for an alliance against the Ottomans while also committing to supporting a Jewish home in the Middle East—all the while secretly negotiating with France over carving up the region into spheres of influence. After the liberation of survivors in Nazi concentration camps at the end of World War II, calls for a Jewish homeland took on a greater moral urgency. But as AND THERE WAS ISRAEL shows, even then, the outcome was far from certain. 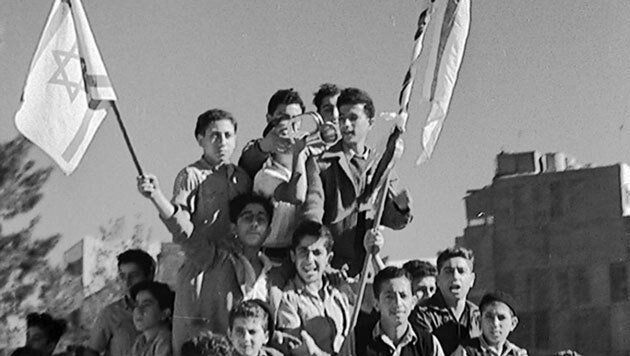 A proposal for a federal state including both Jews and Palestinians was never put to a vote at the United Nations, while behind-the-scenes machinations to ensure support for partition took place. Our guides to this fascinating history are seven academics from the fields of history, sociology, law, and political science, and Middle Eastern studies, each of whom are also talented storytellers. Their narratives of the decades leading up to the formation of Israel are punctuated with British, French, and American newsreels, along with rarely seen footage from within the early United Nations, as the question of partitioning Palestine into separate states comes to the floor. AND THERE WAS ISRAEL is not revisionist history. It is an accessible, clearly argued essay on how Israel came to be, and the far-reaching ramifications of colonial projects.